What if a sudden winter storm overwhelmed your building’s rooftop and caused it to collapse? Or hidden components within your building’s walls warped and weakened it over time to the brink of destruction? If your commercial property suffers a structural collapse, it does not also have to bring down your business. 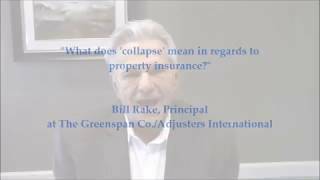 When handling your insurance claim, keep in mind that collapse can be interpreted in different ways, so you want to avoid receiving less than what you deserve. Some buildings are vulnerable to collapse, and for a variety of reasons. In most cases, collapse is already built into your commercial property insurance policy because it can happen to you regardless of where your business is located. In the North, heavy snow on your building may cause roof collapse. In the South, air conditioning units on the top of your building may weigh down and weaken the roof to the point of collapse. Is the damage partial or total? Your insurance company’s team will have their own interpretation about the extent of the property damage and what is covered in your commercial insurance policy. Who is on your team working to protect your interests? Our experts have the experience and resources to evaluate and document your damage in detail and negotiate your claim for the maximum amount. When your business is at stake, you deserve to rebuild and continue operations as quickly as possible. What is my agent or broker’s role? How do I keep my employees? How do I keep my customers? Why is a claim strategy so important? Am I impacted by coinsurance? What do I need to know about the insurance company’s adjuster and experts? Am I entitled to an advance from the insurance company? What is reasonable? What does it mean when the insurance company recommends a preferred vendor? Who will this vendor actually be working for? Contractors may tell you they can do what public adjusters can do. Can they really? What is their background and education in insurance? Are they licensed and bonded? In many states, like California, it’s against the law to practice without a license! The policy says it is your responsibility to submit a reconstruction estimate. Why would the insurer want to do it for you? What is the difference between functional replacement and true replacement cost coverage and why should you care? How is actual cash value determined? Can you do the repairs yourself? Are you entitled to the overhead and/or profit that a contractor would typically charge? What are the benefits and the pitfalls of not replacing your building? Do you have to replace on the same site? Can you buy or build elsewhere? Can you collect building code enhancement coverage if you build elsewhere? How quickly can you start rebuilding following a loss? This whole experience could have been a disaster, but thanks to you and your team, I feel I received the settlement I deserved. If I ever have a claim like this again, you will be the first company I will contact... I also wanted to mention while working through this claim I felt that I had become more than just a client but a friend. This made the whole process much easier for me.